The D10 is a decathlon-style event that combines athletic competition with charitable giving to make a profound social impact on the communities it serves. What do athletes do when they hang up their cleats but their competitive fire doesn’t burn out? Dave Maloney answered this question by creating a decathlon-style competition called The D10. Sometime after running his last race as a track and cross country athlete at Auburn, Maloney found himself working on Wall Street surrounded by other former athletes who had a desire to remain competitive and test their athleticism. The D10 is a celebration of the brilliance of amateur athletes combined with creating a profound social impact on communities. Needing an outlet of his own, Maloney developed a friendly competition format that merges disciplines from track & field, the NFL scouting combine, and even the school yard playground. Wall Street’s athletic elite bought in big time. But even as the event grew, Maloney realized it was lacking an element that transcended physical competition. The D10 needed a philanthropic component to help foster a sense of community amongst its participants. Partnering with the Pediatric Oncology Experimental Therapeutics Investigator’s Consortium (POETIC), Maloney designed a gamified fundraising model that allows spectators and supporters to donate based on the athletes’ performances. Eight short years later, The D10 has raised nearly $10,000,000 for pediatric cancer research. Not coincidentally, The D10 has evolved from an isolated event in New York City into a national athletic tour with team and individual competitions held in New York City, Boston, Chicago, San Francisco, and Maloney’s new home city of Houston. 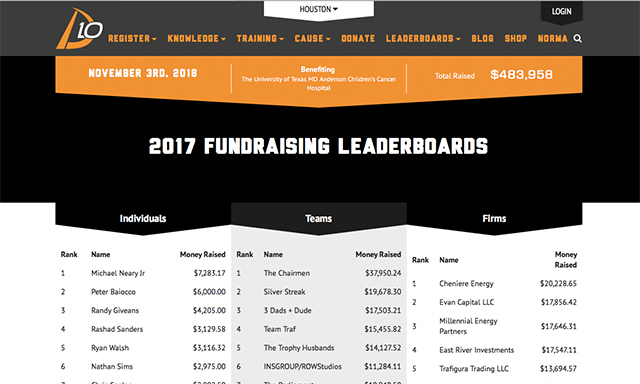 In November 2017, the Houston event raised over $500,000, with 100% of the proceeds going to the MD Anderson Children’s Cancer Hospital. While raising $10,000,000 in just the last few years is a huge accomplishment, The D10 recognizes that its fundraising model is likely to have an even greater social impact. Competitive in its own right, the gamified giving approach allows causes and events to create a highly interactive and dynamic interface that has proven to raise incredible amounts of money. To learn more about supporting, training, and participating in a D10 event, visit The D10 website at TheD10.com.